Standard safety features including 4 airbags, ABS with EBD, Brake Assist, Hill Assist, Reverse Parking Camera, Electronic Parking Brake, etc. Missing features such as front parking sensors, electric adjustment for co-driver, rear charging socket, etc. Chic and Trendy 2012 Honda Civic ?Monster? A car which has over 25 million fans following in 10 generations is really one of the unbeatable feats which Honda Civic has achieved. Forty six years of the iconic journey is what makes it the best-selling Honda in the world. The Japanese carmaker launched the iconic Civic in India back in 2006 and the premium sedan instantly created overwhelming response. People who were familiar with the City sedan found a natural upgrade while those who were against the insipid Corolla found the Civic tempting. The design of the last generation model was seductive while the interiors still remain at its place and the engine which promises to offer fun. The recipe is still the same but made in such a way to synchronize with the time and wow the customers. The new Civic is matured and aggressive on the exterior while offering lavish, upmarket and practical feel inside the cabin. Over the years, the vehicle was only available in petrol engine, but now it comes with the punch of diesel as well. Talking about the exteriors, the moment you stare at it you would not want to take away your sight from it. The bold, sharp and sleek design is enough to exhibit its intentions. The new Honda Civic is a complete head turner with sharp creases across the vehicle given to grab attention. As against the earlier version, the new Civic is 111mm longer, 49mm wider, 35mm lower hood and 17mm lower roof. And couple-like roofline and the elevated rear end is what makes this car an exemplary of sportiness. At the front, adding character to the graceful form there are full-LED headlamps (lower variants with projector ones) with daytime running LEDs. 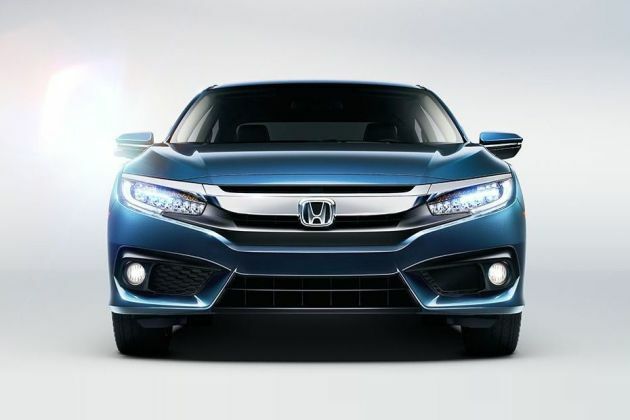 The front profile is flanked by Honda’s signature wing chrome grille with sharp cuts as well as first in class LED fog lamps. Turn to sides and coupe-like silhouette and the new 17-inch diamond cut machine-finished alloy wheels lit up the aura giving unique presence on the road. The ground clearance has been kept in line with the Indian driving conditions. The rear portion is tightly packaged with XL sized tail lights have been given boomerang shape while the light pipes extends up to the boot lid. Dimensionally, the new Civic measures 4656mm in length, 1799mm in width, 1433mm in height while the wheelbase stands at 2700mm. The vehicle is now available in five graceful colour options including Radiant Red Metallic Platinum, Metallic Golden Brown, White Pearl Modern Steel and Metallic Lunar Silver Metallic. Inside, there has to be a revolution since the car is coming after more than a decade. The Civic remain the same with low seating position which might not fit with the taste of older generation of drivers. Space in the car is more than enough with five adults easily fitting into the cabin. In terms of fit and finish, the build quality is nice and dandy all around with soft touch materials used on the dashboard along with texture below the dash top. In the seating department, the cushioning is just right with softer in the centre and firmer at the sides, offering just the perfect blend of comfort and support. And since it’s a Civic, there is no dearth of comfort and convenience as the car has been loaded with gadgets and goodies up to the brim. The car packs dual-zone climate control, leather upholstery and electric sunroof. The infotainment system comes in the form of 7-inch full LCD touchscreen display that is compatible with Android Auto and Apple CarPlay. The 7-inch TFT digital instrument cluster gives you all the visuals of vehicle’s vital information. In terms of comfort, the features include multi-function steering wheel, push engine start/stop button, 8-way power adjustable driver’s seat, remote engine start and auto-dimming IRVM. With ample storage spaces and long armrest, the new version strikes a nice balance between space and practicality. Other comfort aspects include rear ac vents on centre console, auto rain sensing front wipers, door mirrors power adjustable and folding, remote opening and closing of windows, door mirror auto retractable and interior ambient lighting. In the safety department, Honda has you covered all around. The car comes with first in segment LaneWatch system that transmits visuals to the central console to alert you about the surroundings. The standard set of features include 4 airbags, ABS with EBD, Brake Assist, agile handling assist, vehicle stability assist, hill start assist, walk away auto lock, rear seat Isofix child seat anchorage with tether, high speed alert, electronic parking brake and reverse camera with sensors. Move on to the top variants and you not only get the LaneWatch system but also two additional airbags and multi-view rear camera with dynamic guidelines. In terms of specifications, this time around Honda has given the diesel engine option apart from petrol one. The 1.8L petrol motor continues the legacy however it has been tweaked to pump out 141PS and 174Nm of max torque, paired with CVT automatic. The diesel one on the other hand, is the 1.6L 4-cylinder i-DTEC engine that produces 120PS and 300Nm of max torque, paired to 6-speed manual transmission. In terms of performance, the CVT does steals away some part of the driving pleasure however day to day driving will not be impacted. The diesel engine is slightly underwhelming but again pottering in the city would not be a problem, however on highway you might want some extra power. The fuel efficiency in the new Civic is class leading with the diesel engine returning ARAI certified mileage of 26.8kmpl and petrol motor delivering 16.5kmpl. As far as pricing is concerned, the new Honda Civic starts at Rs. 17.7 lakh while the top of the range model has been tagged at Rs. 22.3 lakh, ex-showroom. The new Civic will compete against arch rivals Skoda Octavia, Toyota Corolla Altis and Hyundai Elantra in the segment. The moment you get inside, you will instantly notice that the new Honda Civic is completely driver focused. Once you hop on to the driver’s seat, you will find that the seating position is familiar with the dashboard wrapping you around. The cabin gives you the virtual cockpit feeling with the red and blue lighting in the instrument cluster and the central console slightly tilted towards the driver. However, some might miss the earlier Civic’s split-styled dashboard that featured a digital speedometer placed on the upper half. Further, the new Civic allows tilt and telescopic adjustment for the steering wheel with the seat having the capability to be adjusted in 8 different ways for getting that perfect driving position. People who are not accustomed to low-seating position in a car will need a few trips to get habitual of the comfort and the dimensions. The front seats are narrower so the passengers with large width will find dearth of shoulder support. Moreover, the flat seat base will eat up some valuable underthigh support as well, compelling you to sit in ‘knees up’ position. However, this is not a cause of concern for the driver as the seat height is adjustable. But on the flipside, the co-passenger will be irritated more or less especially over longer journeys. However, this also can be dealt with right to some extent by pushing the seat all the way back and stretch the legs. At the back, this low slung issue can cause more trouble as the door doesn’t open wide enough. While entering you will be putting a lot of pressure on your knee and the same goes for exit as well. So ingress and egress will require a bit of effort, so those who are considering buying this car, especially for the elder members in the family, they should note this. Coming back to the space, the rear seats aren’t generous in this department. For a six-footer, it would be enough to sit behind his own driving position. Moreover, despite the ample width on the exteriors it would be a bit difficult for three adult passengers to sit comfortably at the back. This is especially applicable for the mid passenger due to raised middle part of the rear bench and the central tunnel. And another setback for the middle passenger is that he neither gets fixed nor adjustable headrest. Further, for the 6-footer the roof will be close enough and as linearly raised window lining, it is obvious to feel slightly claustrophobic at this position. There are some areas including practicality where this car shines. You get a lot of cubby holes across the front half of the cabin including storage around the front armrest which is given to spruce up the utility quotient. At the back there are set of cupholders in the central armrest as well as door bins for storing knick knacks. The 430L of boot space is sufficient at the lower side looking from the competition perspective. Sadly, there is no 60:40 rear seat split option for increasing the boot space. On other fronts like quality and fit and finish, Civic scores some brownie points. Unlike the hard plastic of the predecessor, the new Civic is immersed in soft-touch material which gives pleasant experience while putting hands over. Then there is premium leather upholstery and leather inserts on the doorpad which makes the car feel upmarket. The point to be noted here is that the feel of the material is durable unlike the fragile one in few European cars. However, the carmaker has made sure that even the base variant gets oodles of comfort. Talking about the feel good factors, Honda is offering LaneWatch feature. This functionality makes sure that every time you try to turn left, the tiny camera placed under the left wing mirror comes into action relaying video feeds on to the 7-inch display located in the central console. The camera can also be started manually by pressing a button situated on the tip of the right stalk. This function is very helpful especially while parking in tight spots, driving through narrow lanes and while changing lanes as it eliminates any chances of blind spot. And this also creates a small problem i.e. lack of front parking sensors. The low slung nose isn’t everyone’s cup of tea and inclusion of front parking sensors would have made this process a little stress-free. This time around you also get another 7-inch digital TFT screen meant for amplifying the experience found in the instrument cluster. The display allows you to switch through information on calls, music as well as navigation. All this can be controlled through the buttons provided on the steering wheel, ensuring you have all the data in hand all the time. You get access to trip computer, fuel level indicator, engine temperature indicator, Audio & HFT display, outside temperature display, ECON Button & Mode Indicator and Eco Assist Ambient Meter. Other comfort aspects include dual-zone climate control, electric sunroof, remote engine function, push engine start/stop button, rear AC vents, power adjustable door mirrors, interior ambient lighting, auto dimming rear view mirror, paddle shifters and auto rain sensing front wipers. The new Honda Civic sedan now looks absolute swanky and seems to be direct descendant of bigger sibling Honda Accord. There are familiar elements in the form of large grille dipped in chrome, honeycomb details in the air vents as well as crisp character lines finding their way into this sedan. But arguably it’s not a sedan, especially when viewed from the side. It appears to be more like a notchback and this is due to raised rump which is different from a conventional 3-box sedan. And much like the old car, the new one has a low-slung styling making it look like a sporty ready-to-go vehicle. The full LED headlights at the front and the first in segment LED fog lights surrounded by boomerang shaped enclosure, adds to the sensation. The side profile is accentuated by the 17-inch diamond cut alloy wheels while the coupe-like silhouette gives it a sporty and unique presence on the road. The car isn’t the tallest among the league but it is surely widest by a decent margin. The large triangular or boomerang shaped taillights flows beautifully into the bootlid not only looks cool at nights but also gives stylish impression on the go. Overall, the design of the new Civic continues forward the legacy and much stronger than the earlier versions. The engines in the new Civic have been tweaked to give better fuel efficiency this time around. Where the petrol motor paired with CVT gearbox can return 16.5kmpl, the diesel one comes with class leading fuel efficiency of 26.8kmpl which is something that would attract a lot of buyers. The new Civic has been improved on many aspects and suspension is one of them. The car sails through road undulations with ease, thanks to the longer suspension travel that eats up most surprised imperfections and even the cheeky ones effortlessly. The electric power steering offer swift response and you can confidently throw the car at corners as it loves those twisties. On the highway as well, the car remains steady and secure even at three digit speeds. However, if you are hitting imperfections at higher speeds you are bound to witness some vertical bobbles. But the suspension settles all of them quite smartly. The new Honda Civic comes in two powertrain options with the diesel one being the new addition. The 1.6L 4-cylinder i-DTEC diesel engine pumps out 120PS and 300Nm of peak torque, mated to 6-speed manual transmission. The engine is familiar as it is working in Honda CR-V but it’s quite surprising that it does not comes with the smooth 9-speed automatic gearbox. What instantly comes to notice is the NVH levels. When standing outside you will hear a lot of the noise but the moment you get inside you will wonder where all that commotion went. All you will hear is minor vibration and small thrum, that’s it. In terms of performance, the engine let the car get going in bumper to bumper traffic, the credit of which goes to the light clutch and sufficient response in low revs. At most of the times, you will be driving in the second and third gear which does offer enough acceleration. At highways, you can cruise happily at 100-120kmph and that too all the day long. The petrol engine on the other hand, is the tried and tested 1.8L i-VTEC unit that produces 141PS and 174Nm of torque. This is more than sufficient grunt you will need to get through daily chores as well as long weekend trips since the CVT automatic with this engine has been tuned for daily commute. The performance is relaxing as the gearbox doesn’t get confused and there is pin-drop silence from the motor. Though the gearbox is able to hold the higher revs for longer, it isn’t principally fun to drive. However, you have full control over the gears with paddle shifters on the steering but that too isn’t engaging enough. Though this engine and CVT combination works flawlessly for daily office commute, a manual transmission with this engine would have been better. The brakes are made to shed speed quickly giving you total control of the road ahead. This is further cemented through electronic aids such as ABS with EBD, Brake and agile handling assist. The sedan comes with 6 airbags and plenty of other safety aspects including hill start assist, vehicle stability assist, high speed alert system, electronic parking brake and reverse parking camera with sensors and dynamic guidelines. What is the price of Honda Civic? On road prices of Honda Civic in New Delhi starts from ₹ 20.50 Lakh for base variant VX Diesel, while the top spec variant ZX costs at ₹ 21.00 Lakh.